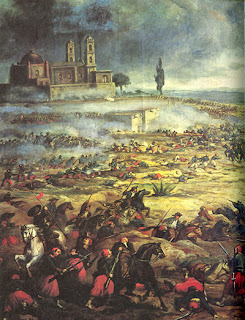 The Battle of Puebla took place May 5, 1862. It pitted some 4,500 members of the Mexican army against 7,000 members of the French army. The Mexicans won that battle and it was almost two years before the French regrouped enough to eventually take Puebla and move on to Mexico City. But in that two year period, the United States was in the midst of the American Civil War. The French had been supporters of the South and intended to use a southern route through Mexico to supply the Southern Confederacy with arms and possibly manpower. Also during that two year period, the Battle of Gettysburg took place. Had the French been able to win that May 5th battle at Puebla, the South may have been better equipped and the Battle of Gettysburg may have had a very different outcome. Of course the South lost the Battle of Gettysburg and eventually the war itself. Interesting stuff, and until this week we didn't realize the significance of the day! Apparently the rainy season has begun. It rained fairly hard overnight and it's actually a bit overcast this morning. Spent yesterday doing more preparations to Sherman getting him ready for his 5 month rest. Gave the roof a bit of a wash and inspected the caulking. Cleaned the windows and screens in the bedroom. Ruth cleaned the oven and sorted the storage area under the bed. A little better day at the polls yesterday, with 174 votes registered to vault us over the 5,000 mark! Great history lesson. I always wondered about the US significance. Great prairie shot. Off to vote than hit the rainy cold for our garage sale, yuck! I remember reading about the significance of this day a while back. I think Americans just like to celebrate no matter what the occasion. Off to hit the vote button. Thanks for the interesting bit of history, Ready to enjoy your travels. THanks for the history lesson. Interesting that Americans would celebrate this. Wonder if the Civil War will ever be over here? You better win!!!!! I so want to see your travels in the outback!! I can't wait to see it with you. We have been there before, just in the Airport (slept there overnight once). I thought that was Alberta. Funny how certain places have a "look" about them. Went to "Head Smashed in Buffalo Jump" back in 03 I think it was. It really is "big sky" country.